There are four main types of cow's milk: whole milk, 2 percent milk, 1 percent milk and fat-free milk, and they are readily available at supermarkets and health food stores. The fat content in milk can be adjusted using centrifugal force, thus changing how many grams of fat serving of milk contains. The butterfat removed from whole milk can be reused to produce buttermilk or butter, additional dairy foods available on supermarket shelves. Whole milk is milk that has not had its fat content reduced. One cup of whole milk contains 8 grams of total fat, of which 5 grams are saturated. This type of milk has the highest fat content of any cow's milk. 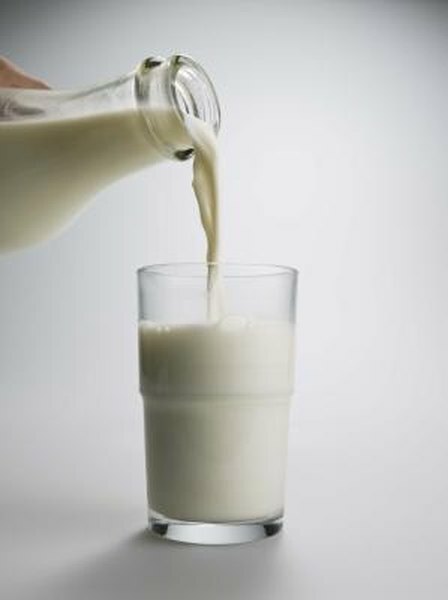 According to the U.S. Department of Agriculture's nutritional database, a 1-cup serving of whole milk contains 158 calories, 8 grams of protein, 13 grams of carbohydrates and 12 grams of sugar. One serving contains 12 percent of the daily recommended value of cholesterol and 30 percent of the daily recommended value of calcium. Milk designated as 2 percent or low fat has a 2 percent fat-to-weight ratio. One cup of this type of milk contains 5 grams of fat, of which 3 grams are saturated. A 1-cup serving of 2 percent milk contains 139 calories, 10 grams of protein, 15 grams of carbohydrates and 13 grams of sugar. One serving also contains 7 percent of your daily recommended value of cholesterol and provides you with 35 percent of your daily value of calcium. As with 2 percent milk, the percentage in this type of milk indicates the percent of fat to weight. One percent milk has roughly half of the fat of 2 percent milk. There are 2 grams of total fat in 1 cup of 1 percent milk, of which 2 grams are saturated. A serving of 1 percent milk contains 127 calories, 10 grams of protein, 16 grams of carbohydrates and 15 grams of sugar. One cup of 1 percent milk also contains 4 percent of your daily recommended value of cholesterol and 38 percent of your daily value of calcium. Nonfat milk has been entirely stripped of its fat molecules. This type of milk is not calorie free, however. And because nonfat milk contains carbohydrates and sugars, it can still affect your weight. This is a good option if you are limiting your fat intake or monitoring your cholesterol. One cup of nonfat milk has 92 calories, 9 grams of protein, 13 grams of carbohydrates and 12 grams of sugar. One serving has 2 percent of your daily value of cholesterol and 31 percent of your daily recommended value of calcium.